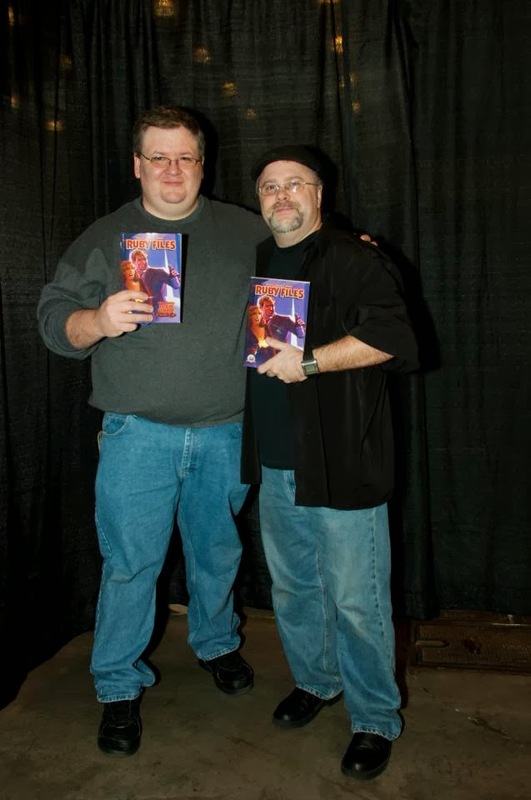 MEET THE RUBY FILES’ SEAN TAYLOR AND BOBBY NASH AT CONNOOGA THIS WEEKEND! The Ruby Files creators and authors, Sean Taylor and Bobby Nash will be guests at ConNooga this weekend (February 21 - 23) in Chattanooga, TN. Always a fun show, the ConNooga Literary Track is incredible and Bobby and Sean are honored to once again be part of it. Their panel schedule was released today and is posted below. If you’re at the con, please stop by and say hello. They will also have table space somewhere in the dealer’s room with books to show off and sell. 1:00 PM Sat Con Center #15 Panel: Pulp Fiction - What is it? 8:00 PM Sat Choo Choo Gallery B Plot or Die! It's a no-holds-barred Plot Off! 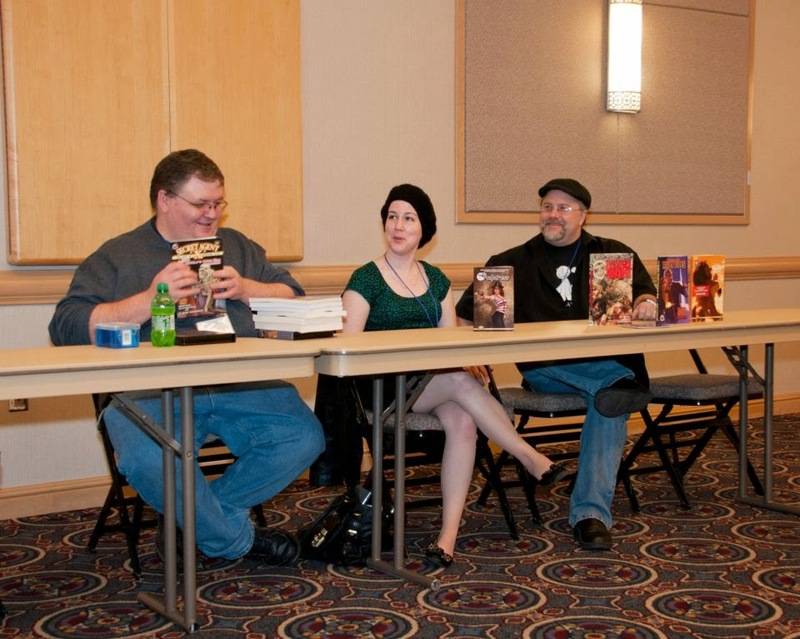 on a panel at ConNooga 2013. All of these sound like fun panels. The highlight of last year’s con was the Saturday night “Plot or Die!” panel. Doing a plot off with the other writers in attendance was the most fun and most laughs had the entire weekend, especially once everyone started trying to one up the others. If you can join us for that, I promise you will not be disappointed. You can learn more about ConNooga here. Plus, keep up with them on Facebook and Twitter. The Con Nooga Lit Track can also be found on Twitter as well. I gave a how-to writing class to a group of high schoolers about two years ago and one of the young men asked me how I wrote female characters. Having written several books starring female protagonists (The Damned Thing, Rabbit Heart and Gravedigger all come to mind), I immediately had a response. I said that you should always start thinking of your characters as people first and gender later. I told him that there is no one “type” of woman out there… there are women who cry at the drop of a hat but then there are women who are tough as nails. There are women who love to shop and wear pink… there are also women who love mixed martial arts and who can drink any man under the table. There are even women who love to wear pink, cry at the drop of a hat, are still tough as nails, love mixed martial arts *and* can drink any man under the table. Women are people first. The same goes for different races or anything, really. I also told him that if he were still worried, to look at the women around him — his friends, his family, his sisters. Think about how multifaceted those women are and then incorporate that into his work. For the last three years The Pulp Ark Awards, awarded in conjunction with the Pulp Ark New Pulp Convention and Writer’s Conference have been the most comprehensive and only fan voted awards for the genre fiction identified as New Pulp. 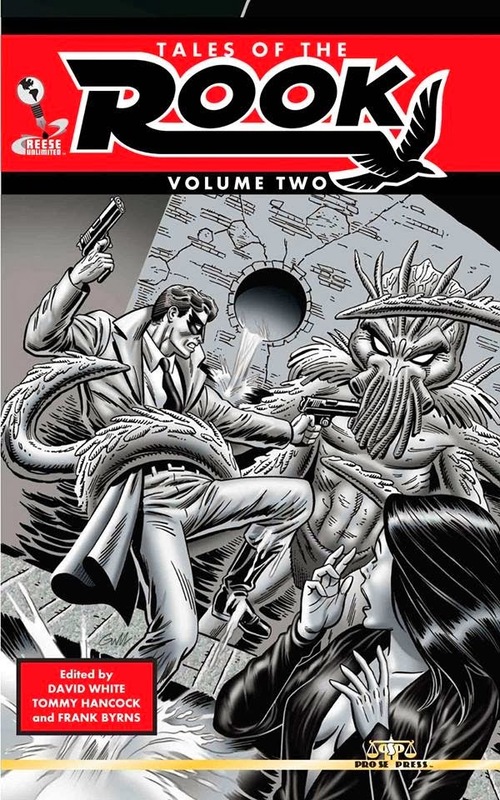 According to Tommy Hancock, founder and coordinator of Pulp Ark and the Awards, although the Convention and Conference will not occur in 2014, the legacy of the Pulp Ark Awards will continue, though with changes, including a new name. Nominations for the 2014 New Pulp Awards are now open and will close at 5 PM CST on February 24th, 2014. Anyone can nominate in any of the available categories for work that was published in 2014, either in print, ebook form, or in an established internet venue, such as an e-magazine. Postings on personal blogs do not qualify. All nominations that are made that fit the qualifications of New Pulp will be placed on the final ballot, regardless of the number of nominations any one work or individual receives. NO CREATOR MAY NOMINATE HIM/HERSELF OR HIS/HER WORK FOR A NEW PULP AWARD. Publishers may, however, nominate works from their own publishing houses as long as the Publisher is not a writer or artist involved in the nominated work. This is also a change from previous years. Hancock also states, “We will also give a Lifetime Achievement Award again this year as well. A Ten Person committee selected from well-known Creators in New Pulp currently will decide the recipient of this award. This award is given to someone who has contributed to Pulp, not necessarily just New Pulp, but to the continuation of the interest and promotion of Pulp in all its forms.” Last year’s winner of the Lifetime Achievement Award was Charles Boeckman. The New Pulp Awards will be awarded as a part of MidSouthCon, in Memphis, Tennessee, on March 23rd, 2014. For more information on MidSouthCon, one of the premiere Pop Culture conventions in the South, go to www.midsouthcon.org. The only works eligible for the 2014 New Pulp Awards are those produced between January 1, 2013 and December 31, 2013. Anyone can make a nomination and anyone that makes a nomination will receive a ballot on February 25th and voting will be open until 5 PM CST on March 11, 2014. Also, ballots will be posted on www.NewPulpAwards2014.blogspot.com and available for anyone who wishes to cut and paste and email the ballot to NewPulp2014@yahoo.com. Each ballot must contain a link to a Facebook page, a Twitter account, an email profile, or some other verifiable source by which the identity of the voter can be affirmed. Although Hancock will still be the Coordinator of the New Pulp Awards, there will be a body of a total of five individuals who will have full access to all information, including the received nominations and votes throughout the process. 11. Best Author (This reward refers to the author and any author with work published in 2013 is eligible, including novels, short stories, etc. This includes e-publications as well). 12. Best New Writer (To be nominated, a writer must have been published for the first time in the pulp field in the calendar year of 2013. This includes e-publications as well). Send all nominations or any questions to newpulp2014@yahoo.com. NOTE: This volume features my tale of the female hero to bear the name The Rook, set in the groovy 1970s, baby. A leading publisher in New Pulp and Genre Fiction, Pro Se Productions announces the debut of its newest title exclusively on the Kindle for a limited time. Compelled through dark dreams to hunt down and destroy evil wherever it might hide! Assisted by loyal friends and a vast array of allies from the annals of Classic and New Pulp as well as Comics of a bygone era, The Rook’s escapades have been a hallmark in the world of New Pulp! TALES OF THE ROOK VOLUME 2 features stories by David White, Sean Taylor, Jim Palmer, Russ Anderson, and Adam Lance Garcia, as well as a new interview with ROOK creator Reese, a script for an unproduced ROOK cartoon short, and an updated timeline of the Reese Unlimited Universe. TALES OF THE ROOK VOLUME TWO takes Reese’s original creation to all new heights, to places not even The Rook has gone before. TALES OF THE ROOK VOLUME TWO is debuting as a Kindle exclusive initially and will be available in print in coming days. TALES OF THE ROOK VOLUME TWO features a wonderful cover by Grant Miehm, logo design and print formatting by Sean Ali, and Ebook Formatting by Russ Anderson. Get Your Kindle Copy today for only $2.99. For review copies of this title, interviews with the authors and creator, and other information concerning this book, contact Morgan Minor, Pro Se’s Director of Corporate Operations at MorganMinorProSe@yahoo.com. For More Information on Pro Se Productions, go to http://www.prose-press.com and like Pro Se on Facebook at http://www.facebook.com/ProSeProductions. 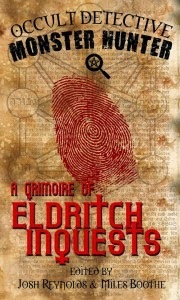 A GRIMOIRE OF ELDRITCH INQUESTS is accepting submissions! And so a different kind of detective is needed—one who understands or at least accepts that not all answers or threats will be human or even physical. What this situation calls for is the Occult Detective. Van Helsing, Carnacki and Thunstone are classic examples. Harry Dresden and Anita Blake are popular contemporary versions. And now we want to read about yours. Give us your best, most fascinating and eccentric characters, or continue the adventures of a character in the public domain. It’s up to you. And make certain that the mystery is supernatural in nature, or at the very least appears to point in an otherworldly direction, even if it ends with a gang of thieves using hallucinogens, a mastiff covered in phosphorescent paint, or even teenagers pulling off a villain’s mask. Occult Detective fiction reaches back to at least 1855, and now we want to continue the tradition in grand fashion with A Grimoire of Eldritch Inquests! Payment: $25.00 and 1 trade paperback and electronic copy of the book upon publication. Word Limits: 2000 to 8000 words. Please query if longer. Format: Submissions should be .doc (.docx is fine) or .rtf formats. The entire text will be reformatted, so no need to worry about margins, spacing, etc. Please use a standard font. Genres Accepted: Dark Fiction, Horror, Sci-Fi and Fantasy. No poetry accepted for this volume. Reprints Accepted: Yes. Please include a history of publication with your submission. Simultaneous Subs: (submitting to Emby and another press at the same time) can be avoided by requesting an early response. Multiple Subs: Each author may submit up to 2 stories. Only one story per author will be accepted. Exclusive Rights: The contract will stipulate 1 year exclusive worldwide print and electronic rights. However, the contract does also state that under certain circumstances, Emby Press will consider granting permission to the author to place the story with additional publications.